HMS M33 is the only remaining British ship from the Dardanelles campaign of 1915-1916 and of the Russian Civil War. The ship is one of just three warships from World War 1. M33 was built in 1915 and was a floating gun platform. Her first active operation was the British landings at Suvla during the Battle of Gullipoli in August 1915. 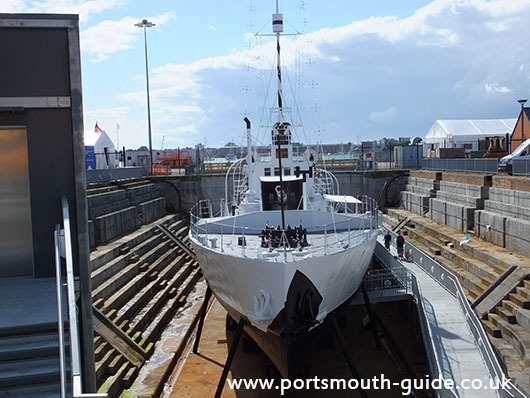 1.8m Heritage Lottery Funds have been used to help preserve the ship as part of a 2.4m conservation and restoration project with M33 opening to the public on 6th August 2015. The ship is housed in No1 dock alongside HMS Victory. Visitors start with a 6metre decent into the bottom of the dock before stepping aboard.